Where? The course took place at the Institute of African Studies at the University of Ghana in Accra, Ghana. It was organized by ICCROM and the University of Ghana. Recorded sound and images have captured our world, our lives and our imagination. They bring knowledge, enjoyment and inspiration to us and enhance many professions, from education, design, software development and human rights advocacy, to those more directly related to audiovisual media, such as film and documentary production. Thanks to rapid advancements in social media and information technologies, it has become much easier to share and use sound and image content. Yet contrary to common perception, not all content is readily usable. Beyond large broadcasting archives and dedicated audio-visual repositories, there is extremely valuable content of sound and image, both still and moving, spread among diverse cultural and research organizations and individual collections –these include museums, libraries, universities, and archives. 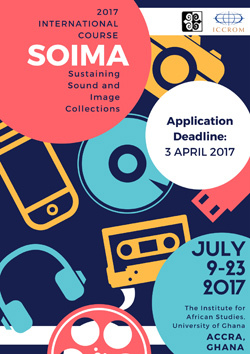 Conceived within the framework of ICCROM’s SOIMA programme, the advanced workshop is tailored to address the challenges of collecting, preserving and using (and reusing) sound, still, and moving image content within the broader context of rapidly changing technology and shrinking resources. It will focus on collection management issues in different institutional contexts that are unique to these types of materials. The emphasis is on strategic decision-making and practical execution of solutions. In particular, it will showcase cost efficient strategies for prioritising content, developing robust digitization and preservation programmes, and ensuring that smaller institutions and communities have the ability to preserve their memory and cultural record. Topics will include: digital preservation, collection assessments, dealing with digitization and documentation backlogs, utilizing innovative open access solutions, intellectual property rights, copyright legislation, community-based archiving and assessing values and meanings of audiovisual collections. By embracing a human-centred design approach, the workshop will be built according to the learning needs of the participants. The course curriculum will be based on projects of preservation and access for audiovisual materials that participants are currently engaged in with their institutions or plan to undertake. The workshop will include topics that help to implement these projects and will help participants to think through common challenges. The goal is to enable change within their own institutions and help develop customised strategies for preservation and use. The Workshop Team will consist of an international team of experts and leading practitioners identified through ICCROM and partners’ professional networks. The workshop invites participation from diverse professionals working in institutions with sound and image collections, educational programmes and the field of information technology. 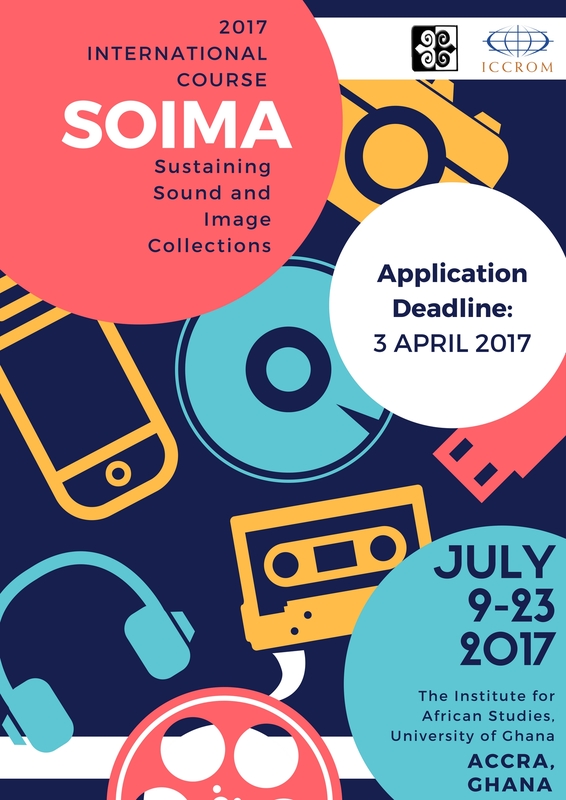 It aims to attract those professionals, who are interested in developing a broader understanding of how different cultural institutions can sustain the preservation and use of mixed sound and image collections. The workshop will be of particular interest to those who are engaged in professional training through formal and non-formal programmes. Former SOIMA course participants are encouraged to apply. Please describe a project that you are currently engaged in or plan to undertake that focuses on preservation and/or access. Please describe your role in that project. Please include any challenges you have encountered in your project as well as any challenges you feel are likely to arise. Participants will be responsible for their round trip travel costs to and from Accra, Ghana. In order to cover living costs during the workshop, participants should plan for a minimum total allowance of €700 Euro. This sum would include the costs of accommodation in moderately priced hotels identified by the organizers. Candidates are strongly encouraged to seek financial support from sources such as governmental institutions, employers and other relevant funding agencies. ICCROM may be able to offer a limited number of scholarships covering accommodation and living expenses only to selected candidates who have been unable to secure funding.